Paid parking in Vail’s parking structures and outlying lots will coincide with Opening Day of Vail Mountain’s 2016-17 ski and snowboard season, now set for Thursday, Nov. 23. Increased early-season transit service will begin as scheduled on Friday, Nov. 17. Parking passes are available for purchase from 8 a.m. to 4:45 p.m. Monday through Friday throughout the season, with the exception of Thanksgiving Day, Christmas Day and New Year’s Day, on the lower level of the Vail Municipal Building, 75 South Frontage Road. For more information on parking pass sales and descriptions, call 970-479-2104 or go to www.vailgov.com/parking. For information on bus schedules, call 970-479-2178 or go to www.vailgov.com/transportation-services. 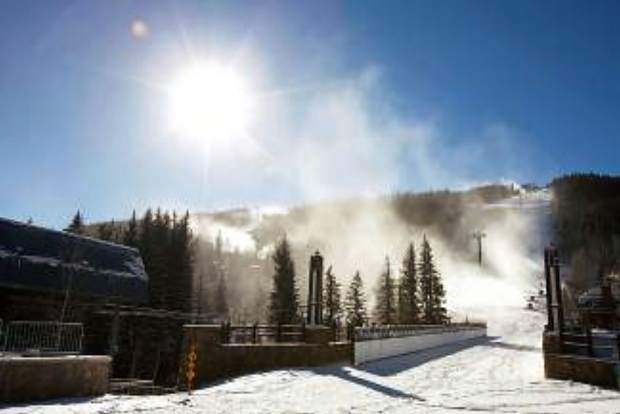 VAIL — For the second consecutive year, Vail Resorts has delayed by a week the opening of Vail Mountain. The new scheduled opening date is Thursday, Nov. 23 — Thanksgiving Day. Beaver Creek is still expected to open Nov. 22. The delayed opening didn’t particularly surprise Matt Carroll, general manager of the Double Diamond Ski Shop in Lionshead Village. Carroll said a neighboring shop owner has snow records dating back to Vail’s first year, and those records show a dry fall every three to five years. The mountain operations team on Vail Mountain had been making snow on the Simba and Born Free runs as much as possible, with a concentration on Born Free. Ultimately, though, lack of natural snow forced the resort company’s hand. The last measureable snowfall at Vail was Nov. 7. The next forecast storm isn’t set to hit until the early-morning hours of Friday, Nov. 17. While the dry conditions that led to the delay aren’t surprising, Hannah Benson, a manager at the Arriesgado clothing store in Lionshead, said the decision to delay is disappointing. “It’s going to delay our training of new employees,” Benson said, adding that the delay also will affect employee scheduling at the store. While this is the second year opening day has been delayed, it’s also not unusual to have bountiful snow to open the resort’s season. In fact, Vail’s 2015-16 season opened with more than 1,000 acres of available terrain. This year, though, the snow is slow in coming. After Friday’s predicted storm, the forecast clears again for several days. The Weather Channel’s 10-day forecast for Vail shows a good chance of snow Nov. 21, but little else beyond. Still, the prospects are somewhat encouraging for snowfall in the near future. The U.S. Climate Center is predicting a better-than-average chance of above-average snowfall over the coming weeks. In addition, a weak La Nina weather pattern has developed in the Pacific Ocean west of Peru. That’s usually good, if uncertain, news for snowfall in the northwestern part of Colorado. While Vail has delayed its opening, other resorts in the Vail Resorts universe are still set to open Friday. A Tuesday news release from the company states that Whistler Blackcomb in British Columbia; Stowe, Vermont; and Heavenly, in the Lake Tahoe area, will all open Friday. In the region, Vail Resorts’ ski areas at Breckenridge and at Keystone are open and, according to the company, set to open more terrain in the coming days. Copper Mountain and Arapahoe Basin also are open. Carroll said while he’s disappointed in the delayed opening, people in his shop have talked about their excitement for the season to come. That’s a good sign, he said.